Choose these Hilarious Style Doraemon Sunglasses as a nice token of your deep-felt wishes and love for the most pampered child of your family and gorge him with chaste happiness. 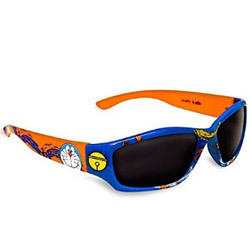 These are mood-brightening Eye-Shades of hearty colours and displaying a fetching Print Texture of Cartoon Characters Doraemon N Nobita and further loaded with traits like Shatter Resistance Pc Lenses, Drawstring Vinyl Soft Case and 100 % UVA N UVB Protection. Flowers Delivery Ujjain, Send sweets Barmer, Wedding Cake Vizag, Diwali Mithai Jamnagar, Send Flowers and Gifts to Panchkula, Online Shop Anantpur, Flower to Kurukshetra, New Year Flowers Vellore , Fresh Fruits Shimla, Send Gift Jodhpur, Dry Fruits to Jallandhar, Birthday Delivery Phagwara, Sending to Kannur, Flower shop Solapur, Raipur Online Cake Delivery.